The Lagotto Romagnolo is a healthy and robust dog with a life expectancy of 15 to 17 years. As with any breed of dog, some health concerns exist. It is important for fanciers of this breed to educate themselves as to these conditions and talk to your breeder about them and the tests they have done. Breeders within the Lagotto Romagnolo Club of America and listed on this website agree to follow a Code of Ethics regarding breeding practices. If looking for a puppy or adult dog, it is recommended that you ask the breeder to share this information with you. Of the conditions that have been found to be genetic in nature and where testing is required; the first is hip dysplasia. Hip dysplasia has been found in several lines, and testing for hips of any breeding dogs is a requirement. Only dogs rated within a narrow range should be allowed to breed. Benign Familial Juvenile Epilepsy (BFJE) appears in the affected puppy at just a few weeks of age and can present as seizures in puppies, but generally resolves once the puppy is about 13-15 weeks of age. Lagotto Storage Disease (LSD) is a severe and ultimately fatal neurodegenerative disease. Affected dogs will have an uncoordinated, staggering gait, and may also exhibit involuntary eye movements (nystagmus) and behavioral changes, such as aggression. The onset of symptoms has varied from 4 months to 4 years. Dogs tested as affected should not be bred. DNA testing is available for both BFJE and LSD. When breeding, at least one parent should be DNA tested clear or normal for each of these conditions. A gene has been found in some breeding lines causing an “incorrect coat”, where the hair may wave, but does not curl. 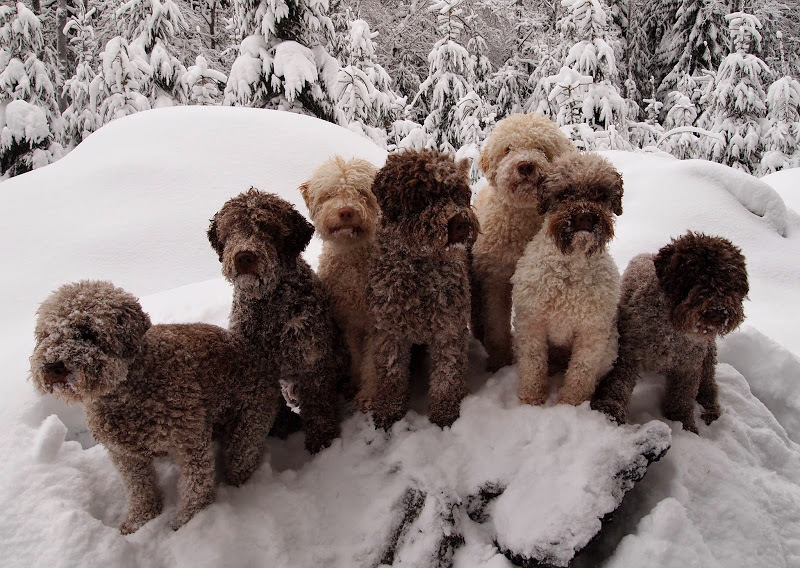 While these dogs look nothing like the classic Lagotto, this is not a health concern. The eyes of any breeding Lagotto must also be evaluated by a Board certified Ophthalmologist on an annual basis while the dog remains in a breeding program. Some breeders may do other structural tests Elbow dysplasia and luxation of the patella are two such tests. Breeders and the Lagotto Romagnolo Club of America continually monitor breeding lines for any health concerns that could diminish the health of the Lagotto. Maintaining the health of the breed and quality of life for the Lagotto is a main concern. Our commitment tothe breed is to keep updated information on this site and provide additional resources as they become available. More detailed information is under the “ Diseases and Conditions” tab.